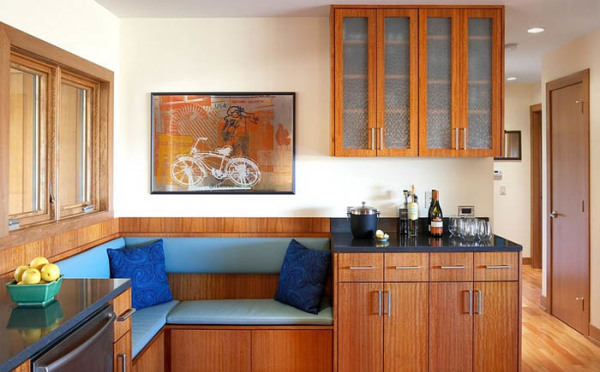 Decorating the corners – it’s a tricky business that requires a balance between form and content. 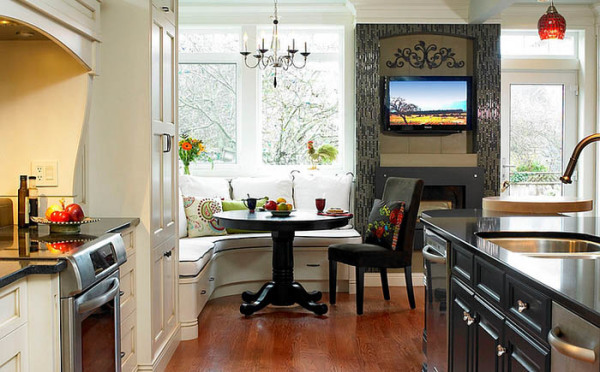 Offer some interesting solutions to help transform one of the most important rooms in a cozy and functional place. 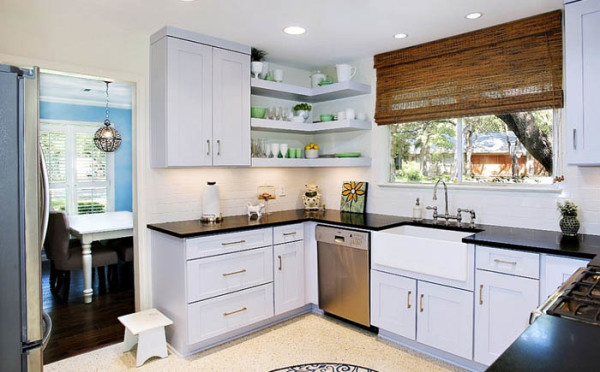 Judicious use of the limited space in the kitchen will not only free the central part, and in general, to solve the problem of lack of space. 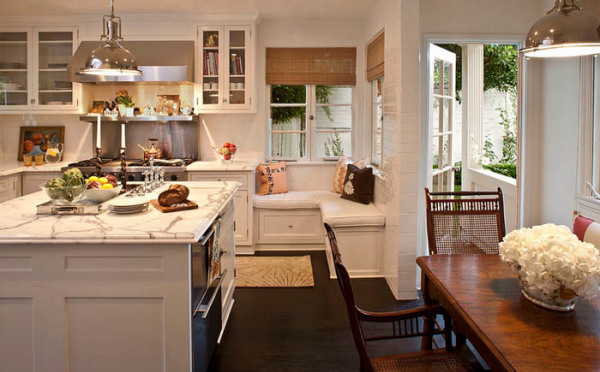 Corners of the kitchen should be used to maximize the functionality and be aesthetically decorated. 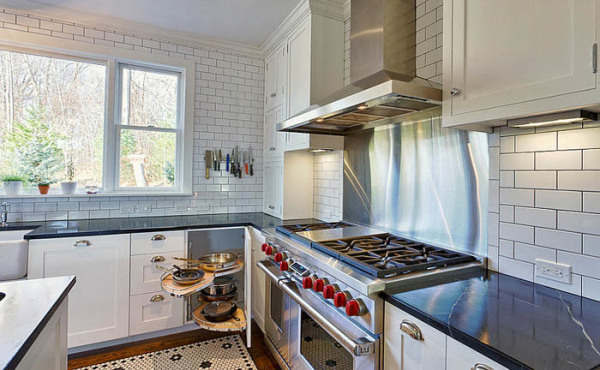 Ideas depend on the size of the kitchen, the existing needs and the overall concept. 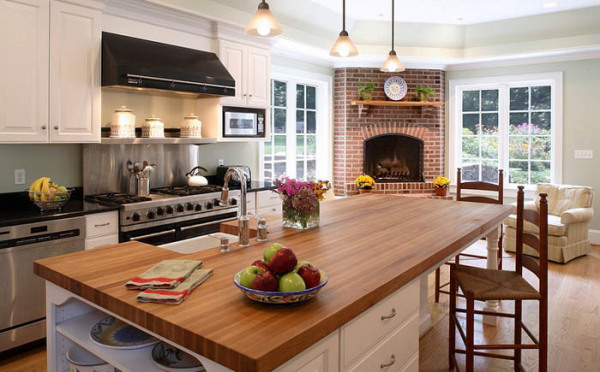 If the kitchen is small, is valued every centimeter, so the use of a corner sink will free up some space. 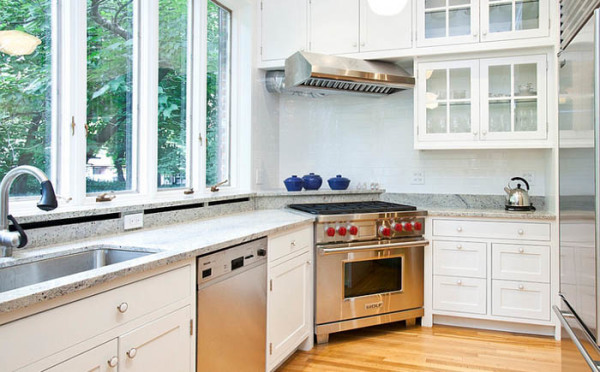 Of course, if the size of the kitchen allow you can choose a more functional sink. Corner model has its pros and cons, but this is the perfect and easiest option to solve the problem of space. If you could not find a corner sink, corner hob and extractor fan – this is another way to increase the space in the kitchen. Corner suites are becoming more popular, but do not forget about proper ventilation system for safety. This plate fits perfectly in the work area with all the lockers, and mezzanines. We vote for hanging shelves for two reasons: they are not only visually expand the space, but also to help fight the mess in the kitchen. You can use these shelves as shelves for the beautiful sets and many other decorative items. 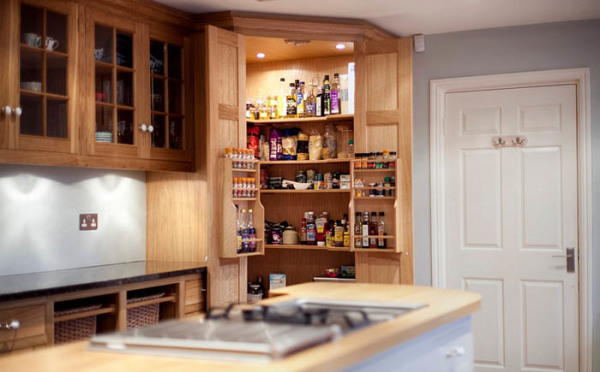 It is necessary to show imagination, install shelves in a free corner and you will be rewarded with extra space in the kitchen. Deep angles are not only aesthetic dissatisfaction, they are little functional. If you put in a corner of a spacious cupboard, appears a lot of extra space. 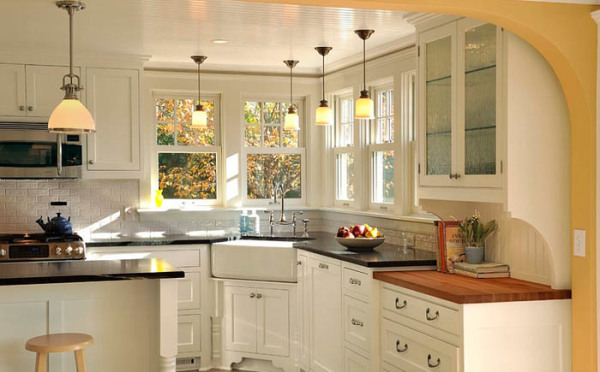 In addition, the interior of the kitchen cupboard revive, bring color and beauty! 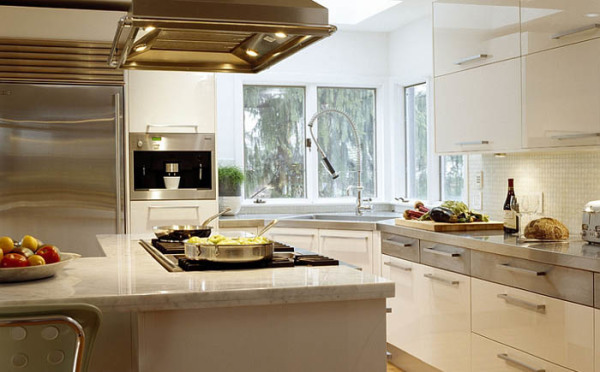 This element of kitchen furniture is never out of date, and if you use the current models, it will be what you need. 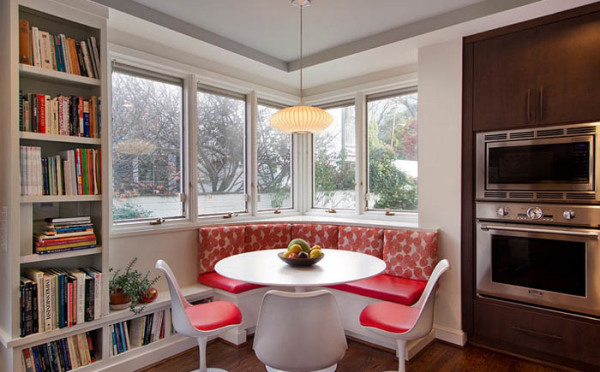 Size corner sofa, style and seating position are selected for interior and size of the kitchen. All you need – a small sofa, chair and coffee table to transform the smallest area in a stylish hideaway, where you can have breakfast with pleasure. 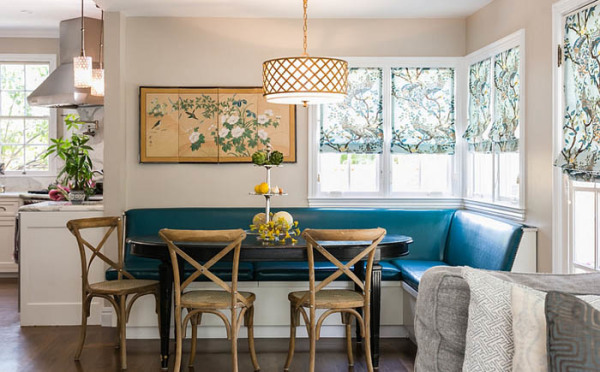 If you think that with a secluded place for breakfast much trouble, just put a couple of chairs and a table in the corner to define the dining room area. This is a great idea for those who do not have a special room for her. The round table in the corner will look perfect. 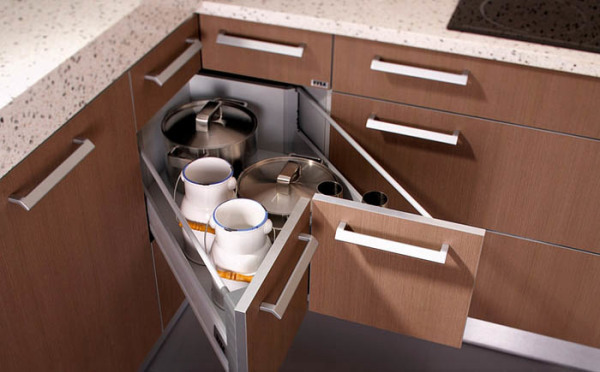 Modern corner drawers are now able to solve the problem with saving space in the kitchen by using angles. 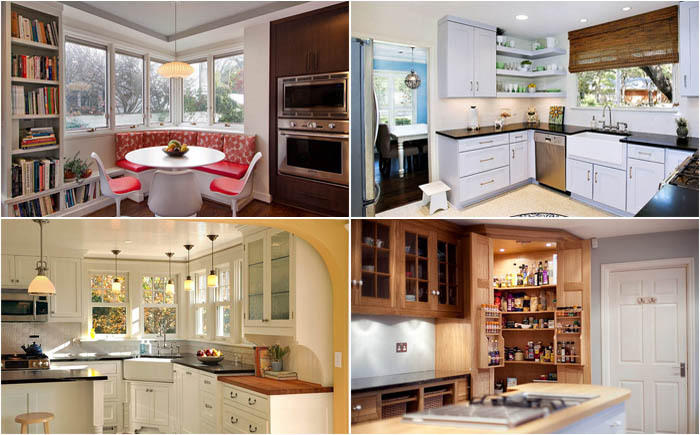 You can choose the model, color, style, are more suited to the interior of the kitchen and needs. 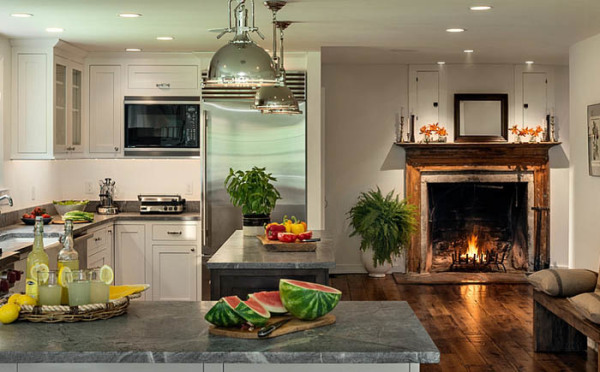 Modern kitchen today – is not only a place for cooking and serving food, a place of communication, where the whole family and friends. The window in the corner, you can arrange a place for gatherings with cozy corner sofa, or even workplace for yourself where you can work and an eye for the children. If you frequently hosts parties, you should install a small bar. Do not be afraid to dream, transforming the angular space. 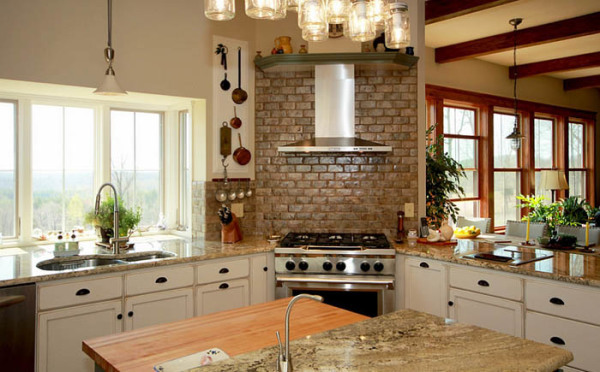 Fireplace in the kitchen is beautiful, and the winter evenings – it is also romantic! On the small kitchen in the corner of the fireplace will be difficult to establish, and large kitchens in homes – a characteristic feature. If there is no desire to fill the corners of shelves and other things, then it will be appropriate to organize a cozy place with a beautiful view of the street. It is simple and beautiful. 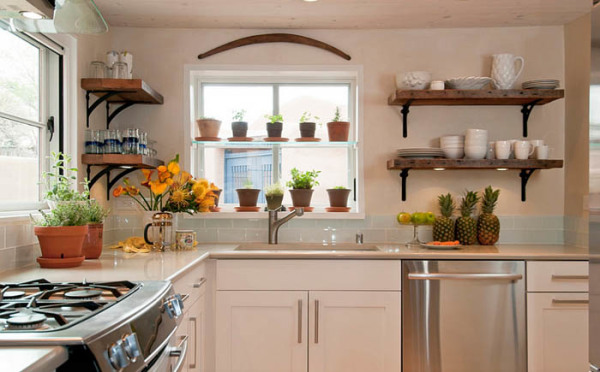 In addition, it will enliven the interior, the kitchen will have more natural light and be able to strike a balance between functionality and aesthetics. However, we can not allow the conversion of angles in the dead zone and in the living room.